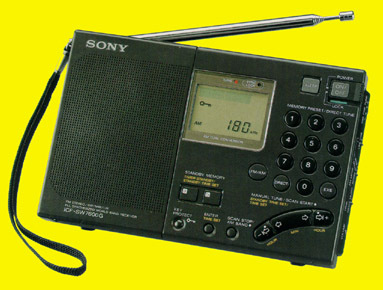 The Sony® ICF-SW7600G is a compact, microprocessor-controlled, frequency synthesized general coverage portable receiver, following on the success of the ICF-SW7600 Direct access tuning is provided along with a multifunction LCD digital readout for unsurpassed convenience and accuracy (1 kHz step tuning on longwave, medium wave and shortwave). The controls are easy to use. Just press the numbered keys to match the frequency you want to hear. Manual and automatic scan tuning are also provided. Twenty-two memories are provided for your favorite stations. The ICF-SW7600G tunes from 150 to 29995 kHz for solid coverage of LW, MW and shortwave. Smooth Single Sideband (SSB) and Morse code reception is provided through a switch with separate LSB and USB positions plus fine tuning thumb-wheel. A special Synchronous Detector circuit reduces fading and annoying "beat" frequency interference from adjacent stations as well as distortion due to fading shortwave reception. FM stereo (76 - 108 MHz) is provided to the mini stereo headphone jack. A record output jack is included for taping off the air. Advanced features include: dial light, LED tune indicator, tilt stand, keypad lock, 24 hour digital quartz clock with dual timer, Local-DX sensitivity switch, 9/10 kHz MW tuning switch, tone switch and external antenna jack. Supplied accessories include: vinyl case, AN-61/71 wind-up antenna and Sony Wave Handbook. Only 7.5 x 4.75 x 1.25 inches 22 oz. (190x120x32 mm 624 g). This radio requires 6 VDC or four AA cells (not supplied). The ICF-SW7600G was replaced by the ICF-SW7600GR. Copyright 1999-2018 Universal Radio, Inc.